When it comes to details- sometimes simple is best. that compliment but in a quiet way. and instead, the whole look that says BAM with capital letters. so that everything comes together as a whole picture. When we were planning the kitchen renovation, I kept that in mind. I knew that I wanted classic. Something that was elegant but also approachable. I am talking cottage with some sparkle. but the backsplash? So many great choices. the rest of the era of the kitchen. Is it too plain or too simple? Whoever said that white subway tile was plain was wrong. Friends- white subway tile is amazing. 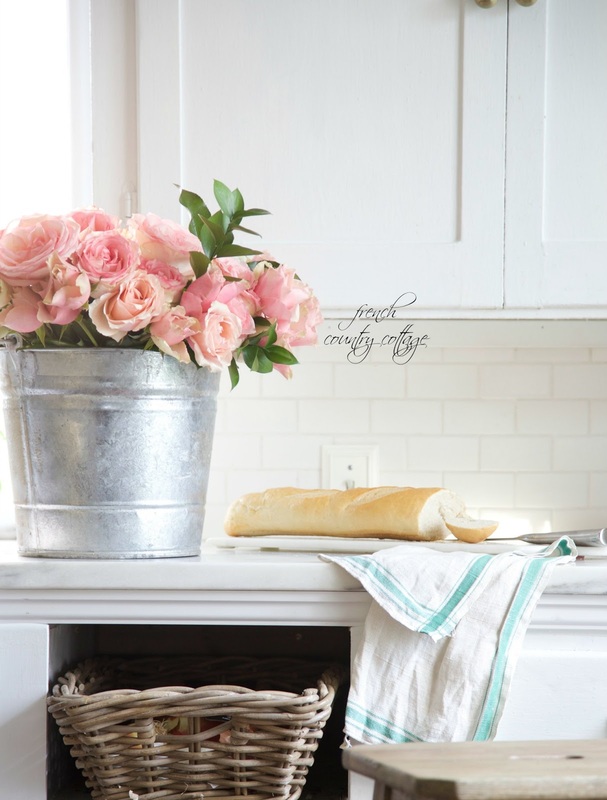 to something like a gorgeous marble countertop and fluted farm sink. They are a little more expensive- but in my opinion worth it. so it was an easy decision. (Yes- we did use teeny tiny nails to secure the sheets while waiting for them to dry. so - safety first folks. The other safety? Protect your counters and floors. Thick paper on a roll can be found at the hardware store- roll it out and tape it down to secure it. The mixture for grout will scratch and ruin surfaces- don't ask me how I know. Overall though, a fairly easy job. and I grouted on my own a few days later. kind of like the dark lines -which is not the grout- it is just the tile lines waiting for grout. and then decided it was mostly what I saw when I walked by. So I went back to my first thought which was simple white grout to keep the look cohesive. 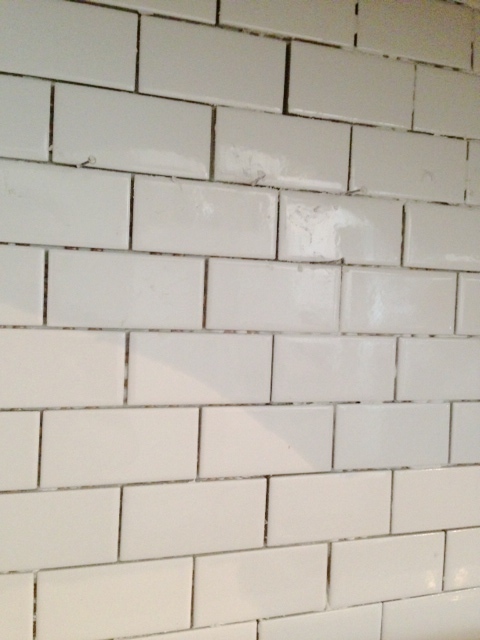 Grout is easy to apply- you just fill in the grout lines and wipe off the excess. It is a messy, messy job though- so keep that in mind. But it is rewarding as you go along and see the difference it is making. After the grouting was wrapped-it was clean up and enjoy time! 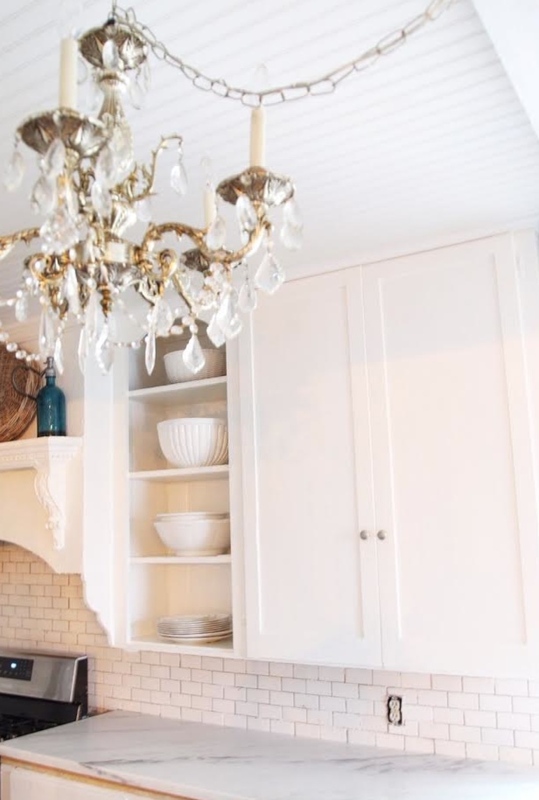 for this vintage kitchen refresh. without overpowering the space- which is exactly what I was looking for. If you have any questions- let me know and I will try to answer them. and the perfect earrings to go with it. Your choices in design beautifully made and shows off its space amazingly. This room does not compete for attention up against each elament used ..... BRAVO Courtney! Your calculated well thought out choices make your cottage kitchen timeless, Gasping every time I visit. Stunning! Your kitchen is absolutely fantastic! I, too, want to install white subway tile. I agree with your opinion that it is elegant and classic. Courtney, the white subway tile black splash looks beautiful!!! So classic and I love it with the marble counters. I want to add the same tiles and counters in our house when we finally get around to redoing our kitchen:). 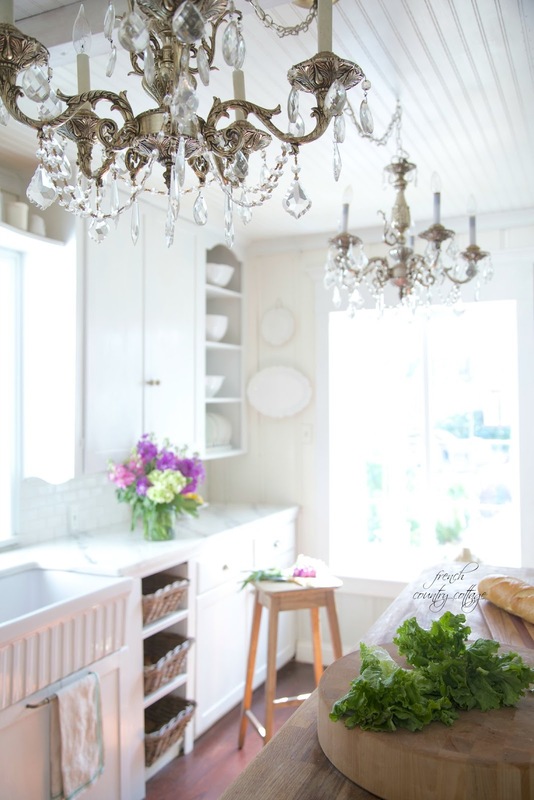 Courtney, you have one of the most "to die for" kitchens in all of blogland..you are such a lucky and talented girl! Enjoy your gorgeous re-do! Simply stunning! I agree with everyone else! Absolutely amazing! I think that is absolutely true- the perfect earrings are just that and play a part in the whole look! It is the 'earrings' that just don't go or are too showy that to me feels like they take away and grab the attention. Thanks for stopping by Lory! Beautiful! It so clean and fresh. 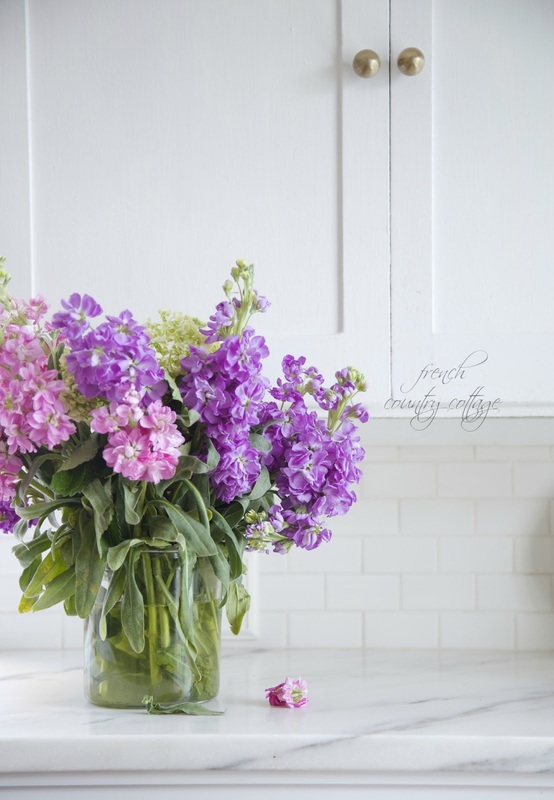 Makes a wonderful backdrop for all your little pretties. Nicely done! Your kitchen is absolutely beautiful. Wow, you are amazing installing all that tile yourself! 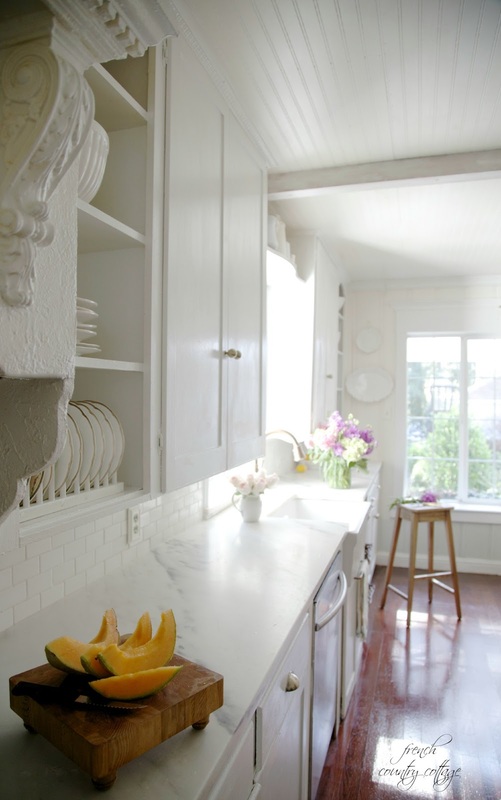 I love carrara marble for my kitchen counter tops. But I worry they are very delicate. I do have them in my master bathroom and they are gorgeous. But I am scare to install them in the kitchen. What is your input, advice, experience with marble in your kitchen? J'aime la clarté de votre cuisine. Merci pour le partage de vos photos. J'ai utilisé chez moi un carrelage presque similaire pour le petit coin toilette des invités. Truly lovely choices!! The overall effect is beautiful. Nothing screams at you like huge earrings--just classy Audrey Hepburn.I would love to change our counters and back splash -- it is turquoise. No we didn't pick it out it was here when we downsized. Your kitchen certainly is an inspiration. I love everything about this room but especially all the bright white with the golden chandeliers. I am planning to use Carreras marble for our countertops but need to paint out kitchen cabinets. What paint did you use for your cabinets and how are they holding up? Did you use an oil base? Beautiful!! We bought the same tile for our backsplash and I love your grout choice, it's white but there's a hint of definition. Would you mind sharing what brand/color you used? Thanks! Courtney, I am new to your blog. I love your decorating style. 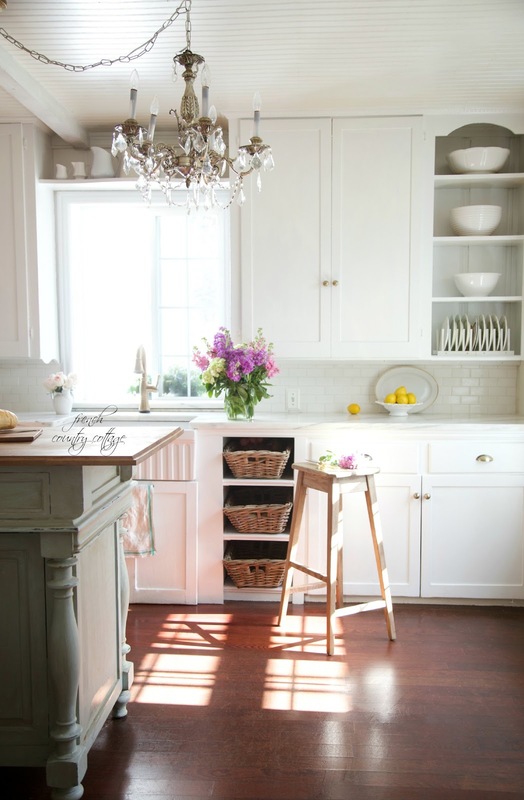 Do you have a source for the wood top in laundry room and on your kitchen island? I would like an island top like yours and wood counters in our laundry room.